Head coach Mike Vrabel said Mariota (neck) is on pace to be ready for OTAs in April, Erik Bacharach of the Nashville Tennessean reports. Analysis: Mariota took a seat in Tennessee's regular-season finale in order to protect a neck injury that was causing nerve issues in his throwing hand. The injury apparently wasn't severe enough to require surgery or treatment of any kind, though, so Mariota only had to rest and lay low in order to recover. 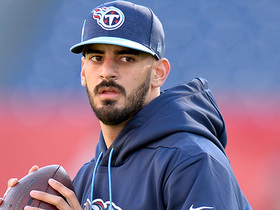 It sounds like that plan has worked swimmingly thus far, and it will set Mariota up for a full offseason to lead the Titans offense in adjusting to life under new offensive coordinator Arthur Smith. Mariota (neck/foot) will work with the same playbook terminology in 2019 after the Titans promoted Arthur Smith to replace the departed Matt LaFleur as their offensive coordinator, Jim Wyatt of the team's official site reports. A spine doctor told Mariota (neck/foot) he shouldn't play in Sunday's game against the Colts, Paul Kuharsky of 104.5 The Zone Nashville reports. Mariota (neck/foot) is inactive for Sunday's game against the Colts, Jim Wyatt of the Titans' official site reports. Analysis: With Mariota inactive, Blaine Gabbert will start Sunday night's win-or-go-home contest, with Austin Davis on hand to serve as his backup. Mariota (neck), who is listed as questionable for Sunday's game against the Colts, isn't expected to play in the contest, Chris Mortensen of ESPN reports. Mariota (neck/foot) will participate in a pregame warmup with the intention of playing Sunday against the Colts, Ian Rapoport of NFL Network reports. Mariota (neck/foot) is listed as questionable for Sunday night's game against the Colts after practicing in a limited fashion both Thursday and Friday, Jim Wyatt of the Titans' official site reports. Coach Mike Vrabel called Mariota (neck/foot) a "limited" participant at Friday's practice, Travis Haney of The Athletic reports. "We'll just keep seeing where it goes and who gives us the best chance [Sunday against the Colts]," Vrabel said regarding the quarterback situation. Mariota (neck/foot) was officially limited at practice Thursday, Turron Davenport of ESPN.com reports. Mariota (stinger) was able to get some throwing in at Thursday's practice, Turron Davenport of ESPN.com reports. Analysis: We'll have to see how the Titans officially list Mariota's participation level, but his presence on the field Thursday and ability to throw in the process, would appear to bode well for the QB's chances of giving it a go Sunday against the Colts. Per John Glennon of The Athletic, Mariota, who appeared to split reps with fellow signal-caller Blaine Gabbert, was able to make both "short and long throws, probably less velocity than normal." Coach Mike Vrabel said Mariota (elbow) could play in Sunday's game against the Colts without practicing at all this week, Jim Wyatt of the Titans' official site reports. Coach Mike Vrabel hopes that Mariota (stinger) can practice Thursday, Jim Wyatt of the Titans' official site reports. Analysis: Mariota didn't practice Wednesday, instead undergoing treatment related to the stinger he suffered in Week 16. His status for Sunday's win-or-go-home contest against the Colts won't be clarified until later this week, but the quarterback previously stated that he intends to give do whatever he can to give it a go. In Mariota's absence at practice, Blaine Gabbert handled first-team reps.
Mariota said Wednesday in an interview with 104.5 The Zone Nashville that the elbow stinger he suffered in Saturday's 25-16 win over the Redskins resulted in the right side of his body becoming "numb and tingly," Jim Wyatt of the Titans' official site reports. "I'll do everything in my power to see if I can go [Week 17 against the Colts]," Mariota said. "Again, it is just taking it one day at a time." Coach Mike Vrabel confirmed Monday that Mariota is dealing with a stinger, but noted the injury isn't related to the one he dealt with earlier in the season, Turron Davenport of ESPN.com reports. Mariota (elbow) left Saturday's contest against the Redskins late in the second quarter with a stinger. He finished 10-of-13 on pass attempts for 110 yards and no touchdowns in the 25-16 victory. Analysis: Mariota was labeled as questionable to return at halftime, but he never came back from the locker room. Head coach Mike Vrabel said that the team is still awaiting the results of tests done by the medical staff, according to Jim Wyatt of the Titans' official site. Blaine Gabbert (101 yards and a touchdown) finished off Saturday's win, and would be in line to start the final game of the regular season against the Colts if Mariota's injury forces him out of action. Mariota is questionable to return to Saturday's contest with a stinger, Jim Wyatt of the Titans' official site reports. Analysis: There was some chatter that Mariota might be able to return following an injury late in the second quarter, but the quarterback has missed the first two possessions of the second half and is currently still undergoing tests in the locker room. 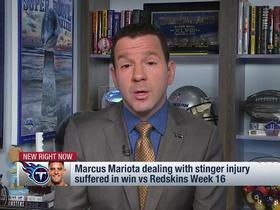 Mariota previously missed time in Week 11 with a stinger and was unable to return to the game. Blaine Gabbert has been fielding snaps under center in his stead. Mariota left Saturday's game late in the second quarter and was taken to the locker room with an unidentified injury, Turron Davenport of ESPN.com reports. 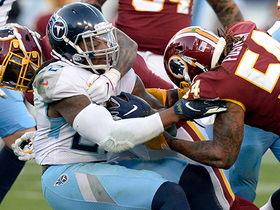 Analysis: Late in the second quarter, Mariota was sacked by the Redskins' Jonathan Allen and appeared to come up groggy. While it's unclear exactly what Mariota might have hurt, he did land on his elbow and immediately walked off to the locker room. More information regarding the injury and the quarterback's status for the rest of the contest should be available prior to the start of the second half. Mariota (foot) was a full practice participant Wednesday, Turron Davenport of ESPN.com reports. Analysis: The upgrade from a limited showing Tuesday answers any questions about Mariota's availability for a home game against Washington on Sunday. He attempted just 44 passes the past two weeks, allowing Derrick Henry to do all the heavy lifting. 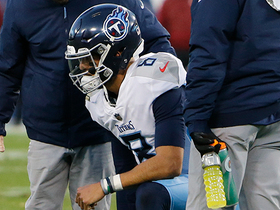 Mariota was listed as a limited participant on the Titans' injury report Tuesday due to a foot injury, Jim Wyatt of the team's official site reports. Analysis: Mariota has played through elbow, neck, hand and abdominal issues already this season, so it's fairly safe to say he's not in danger of an absence Saturday against the Redskins due to his listing on Tuesday's practice report. That said, his status still should be watched closely as the week goes on. Mariota completed 12 of 20 passes for 88 yards with no interceptions and no touchdowns in Sunday's 17-0 win over the Giants. He also rushed the ball twice for 11 yards. Mariota (abdomen) does not carry an injury designation for Sunday's game against the Giants, Turron Davenport of ESPN.com reports. Mariota (abdomen) was limited at Friday's practice, Jim Wyatt of the Titans' official site reports. Analysis: We'll have to see how the Titans officially list Mariota for Sunday's game against the Giants, but so far there is nothing to suggest that his Week 15 status is in any danger. Mariota completed 18 of 24 passes for 162 yards with no touchdowns and one interception in the Titans' 30-9 win over the Jaguars on Thursday. He also rushed four times for 13 yards. Updating a previous report, Mariota (right hand) practiced fully Tuesday, Jim Wyatt of the Titans' official site reports. Analysis: Mariota's assertions that his Week 14 status is not in jeopardy were validated by Tuesday's official injury report in advance of Thursday night's game against the Jaguars. He's put up solid fantasy numbers over his last two games, but Mariota faces a challenge this week while going up against a Jacksonville defense that dominated the Colts in a 6-0 victory in Week 13. Though he was limited in practice Tuesday, Mariota (hand) indicated that there are no doubts about his status for Thursday's game against the Jaguars, Turron Davenport of ESPN.com reports. Analysis: We'll have to see if the QB ends up with an injury designation for the contest or is removed from the Titans' Week 14 injury report altogether come Wednesday, but based on Mariota's comments, it looks safe to roll with him as usual in fantasy lineups this week. Mariota (hand) is listed as a limited participant on the Monday practice report, Paul Kuharsky of 104.5 The Zone Nashville reports. Analysis: The Titans didn't actually practice, but if they had, they estimated Mariota would've been limited by an injury to his throwing hand. He didn't seem to have any trouble in Sunday's 26-22 comeback win over the Jets, completing 20 of 35 passes for 282 yards, two touchdowns and an interception. Mariota did have issues with his throwing elbow and hand earlier this season, so it's worth keeping an eye one as the Titans continue to prepare for Thursday's game against the Jaguars. Mariota completed 20 of 35 passes for 282 yards, two touchdowns and an interception in Sunday's 26-22 win over the Jets. He also rushed four times for 43 yards. Mariota completed 22 of 23 passes for 304 yards and two touchdowns in Monday's 34-17 loss to the Texans. He also rushed six times for 28 yards. Mariota (neck) doesn't have an injury designation for Monday's game at Houston, Jim Wyatt of the Titans' official site reports. Analysis: Mariota began the week as a limited practice participant but faced no limitations the past two days as he was dealing with some numbness in his right arm caused by a stinger. Coach Mike Vrabel indicated Friday the 25-year-old should return to his starting role given his full practice participation, and avoiding a setback Saturday clears the way for Monday's divisional tilt. Mariota (neck) progressed to a full practice Friday, Jim Wyatt of the Titans' official site reports. 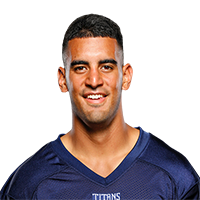 Analysis: ESPN's Turron Davenport relays that Mariota is on track to start Monday night's game against the Texans, though coach Mike Vrabel has yet to officially confirm that likely outcome. "I would imagine that Marcus is going to be the starting quarterback after being not limited, and full, and probably hope to start," Vrabel said of Mariota following Friday's practice. "It looked good today, but that's why you practice. You try to always improve and get better." Mariota (neck) was listed as limited during Thursday's walk-through practice session, Jim Wyatt of the Titans' official site reports. Mariota (neck) said Wednesday that he only threw during the individual period of the Titans' practice and considers himself day-to-day in advance of Monday's game against the Texans, Travis Haney of The Athletic reports. Mariota (neck) was present for the open portion of Wednesday's practice and was seen throwing short passes to a team trainer, John Glennon of The Athletic reports. Mariota has been diagnosed with a stinger, rather than the elbow injury previously reported, Turron Davenport of ESPN.com reports. The elbow injury that resulted in Mariota's early departure in Sunday's 38-10 loss to the Colts may be related to the nerve issue the quarterback dealt with earlier in the season, Ian Rapoport of NFL Network reports. An update on Mariota's elbow injury that forced him out of Sunday's 38-10 loss to the Colts will be provided Monday, ESPN's Turron Davenport reports. Analysis: Coach Mike Vrabel relayed after the contest that Mariota -- who also dealt with an elbow issue earlier this season -- indicated after exiting Sunday's game that he was okay, but the team decided to stick with Blaine Gabbert with protecting Mariota's health in mind. At the very least, we expect the issue to impact Mariota's practice participation leading up to next Monday's game against the Texans. Mariota was forced out of Sunday's game against the Colts with an elbow injury, John Glennon of The Athletic reports. Analysis: After exiting Sunday's game in the second quarter, Mariota -- who dealt with an elbow issue earlier this season -- was back on the Titans' sideline to start the second half. However, Blaine Gabbert remained in the contest for the team's first third-quarter series on offense. Mariota (undisclosed) exited Sunday's game against the Colts in the second quarter, John Glennon of The Athletic reports. Analysis: Mariota was spotted shaking his right arm/shoulder following the play that preceded his exit. He was replaced in Sunday's contest by Blaine Gabbert. Mariota completed 16 of 24 passes for 228 yards and two touchdowns while rushing twice for 21 yards and adding a 21-yard reception in Sunday's 34-10 win over the Patriots. Analysis: Mariota finished each of Tennessee's first two drives with a passing touchdown -- first finding Jonnu Smith from four yards out and then Corey Davis from 23. 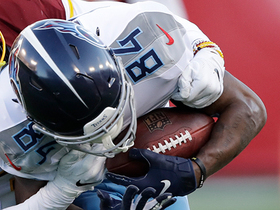 The Titans never relinquished that lead, relying mostly on the run to chew clock in the second half. Mariota will lead his team into a pivotal Week 11 road game against the division rival Colts after consecutive efficient, two-touchdown outings in wins. Mariota completed 21 of 29 passes for 240 yards and two touchdowns in Monday night's 28-14 win over the Cowboys. He also rushed 10 times for 32 yards and another score but lost two fumbles. Mariota has regained feeling in his hand and is no longer practicing with a glove, Terry McCormick of TitanInsider.com reports. Analysis: Mariota has been a disappointment through the first half of the season, throwing for only three touchdowns while being picked off five times. However, the improved health of his hand provides reason for optimism that his performance will improve as the season progresses. Coming off a bye week, Mariota specifically cited improved red-zone efficiency as a key to improving what has been an abysmal Titans offense through seven games. He'll draw a tough matchup on Monday night against the Cowboys. Mariota completed 24 of 32 passes for 237 yards, one touchdown and one interception in Sunday's 20-19 loss to the Chargers. He also added seven carries for 38 yards. Analysis: Mariota surpassed 150 passing yards for only the second time this season thanks to a 75.0 percent completion rate. However, his downfield shots remain limited, as he completed only two passes of more than 20 yards in the performance. Overall, Mariota has just three touchdowns this season, and he's still likely hampered by the elbow injury he suffered in Week 1. Nevertheless this was an encouraging performance, even if it doesn't push Mariota into top-12 consideration at the position. Mariota completed 10 of 15 passes for 117 yards during Sunday's 21-0 loss to the Ravens. He added two rushes for 25 yards. Mariota said he still isn't ready to play without a partial glove covering his throwing hand, Terry McCormick of TitanInsider.com reports. Analysis: Mariota has been using the modified glove ever since Week 1, when he injured his throwing elbow and experienced trouble with gripping the football. He was unable to build on a huge Week 4 outing against the Eagles, completing 14 of 26 passes for 129 yards with no touchdowns and an interception during Sunday's 13-12 loss to the Bills. Mariota will have a tricky matchup Sunday when the Titans play host to the Ravens. Mariota completed 14 of 26 passes for 129 yards and an interception during Sunday's 13-12 loss to the Bills. He added two carries for 10 yards. Mariota completed 30 of 43 passes for 344 yards, two touchdowns, and an interception during Sunday's 26-23 win over the Eagles. He added 46 yards and a touchdown on 10 carries. Coach Mike Vrabel said the Titans hope to have a larger array of plays for Mariota this Sunday against the Eagles, Jim Wyatt of the team's official site reports. Analysis: Mariota donned a glove on his right hand when he entered last Sunday's eventual win at Jacksonville, but downfield throws were not a part of the equation due to lingering issues with his elbow and hand. After Mariota practiced in full this week, Vrabel seems to think such throws will be sprinkled into the game plan Sunday, boosting the prospects of Mariota and the Titans' skill-position talent. There's nowhere to go but up for Mariota on the heels of a 100-yard passing performance Week 3. Coach Mike Vrabel said Mariota (elbow) will start Sunday's game against the Eagles, Terry McCormick of TitanInsider.com reports. Analysis: Mariota ended up playing the majority of Sunday's 9-6 win over Jacksonville after Blaine Gabbert suffered a concussion in the first half. Vrabel acknowledged that Mariota still had some limitations in terms of the throws he could make during the narrow victory, but the team is optimistic that won't be the case in Week 4. Vrabel said said Austin Davis will serve as the No. 2 quarterback, dropping a strong hint that Gabbert isn't expected to clear the concussion protocol before Sunday. Coach Mike Vrabel said there are still throws Mariota can't make as he works his way back from an elbow injury, Jim Wyatt of the Titans' official site reports. Mariota (elbow) completed 12 of 18 passes for 100 yards while adding 51 yards on seven carries in Sunday's 9-6 win over the Jaguars. Mariota (elbow) entered Sunday's game against the Jaguars after Blaine Gabbert, who started the game, headed to the locker room to be evaluated for a concussion, per Jim Wyatt of the Titans' official site. Analysis: Mariota, who has been nursing an elbow injury, began the game as the team's backup, but once Gabbert was forced out of the game, Mariota took over at QB for the Titans. It remains to be seen how much his elbow injury affects his grip (and throwing), but with Tennessee only carrying two signal-callers on their active roster, the team had no choice but to turn to Mariota, even at less that 100 percent. Mariota (elbow) is listed as active for Sunday's game against the Jaguars and expected to serve as the Titans' backup quarterback behind Blaine Gabbert, per Adam Schefter of ESPN. Analysis: Mariota has been making progress in practice since suffering an elbow issue Week 1, but the Titans are evidently inclined to take it slow with the QB, thus prompting the team to lean on Gabbert for the second straight week. Mariota (elbow), who is listed as questionable for Sunday's game against the Jaguars, is expected to be active for the contest but will likely serve as the backup quarterback behind Blaine Gabbert, Ian Rapoport of NFL Network reports. Mariota (elbow) is listed as questionable for Sunday's game at Jacksonville, Jim Wyatt of the Titans' official site reports. Analysis: Mariota was active Week 2 but didn't take any snaps due to lingering numbness and tingling in his right hand, which has been his reality during Week 3 prep. 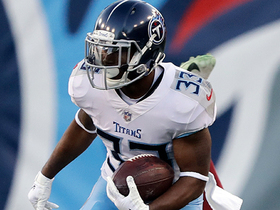 He appeared to look close to usual self at Thursday's practice, but the Titans still seem to be wary about introducing him to in-game contact. Coach Mike Vrabel said Friday that the team will make a decision on Mariota in the next 24 hours. If Mariota is eventually ruled out, Blaine Gabbert will get the nod at quarterback. Offensive coordinator Matt LaFleur noted that Mariota looked as good in practice Thursday as he has since suffering his elbow injury, Jim Wyatt of the Titans' official site reports. Analysis: Meanwhile, coach Mike Vrabel confirmed that Mariota is doing better as of Thursday and was able to do more in practice. He was officially deemed a limited participant. The QB is therefore trending in the right direction, but Friday's final injury report of week should be telling with regard to Mariota's chances of starting Sunday's game against the Jaguars. Mariota (elbow) acknowledged Wednesday that he still feels some numbness and tingling in his fingers, Jim Wyatt of the Titans' official site reports. "It is getting better," Mariota said. "It is frustrating, and it is hard because it is one of those things where you can't really do a whole lot." Coach Mike Vrabel said Mariota (elbow) will be re-evaluated Wednesday, Travis Haney of The Athleticreports. Analysis: The Titans have taken a cautious approach with Mariota, and Vrabel reiterated earlier in the week that the young quarterback wouldn't be rushed back onto the field. Wednesday's update should provide a clue as to Mariota's availability in Week 3, though even if he can return to the field, he will draw a tough matchup at Jacksonville. Coach Mike Vrabel said Monday that Mariota (elbow) won't play until he's ready, Jim Wyatt of the Titans' official site reports. "There's some things he can do, and there's some throws that he can't really comfortably make," Vrabel said. "So we'll see where he's at as this thing goes on." Analysis: Mariota was active but didn't take the field Sunday against the Titans, yielding his usual starting spot to backup quarterback Blaine Gabbert. Until Mariota gets over his elbow injury -- i.e. he's able to make all throws without complication -- he doesn't appear to be a candidate to play. His status remains in flux for the Titans' Week 3 divisional matchup in Jacksonville. Mariota (elbow) did not play on Sunday, but dressed, Jim Wyatt of the Titans' official site reports. Analysis: The Titans offense was pretty conservative with Mariota out of the lineup on Sunday. The fact that Mariota was healthy enough to have presumably come in if backup Blaine Gabbert was injured during the game would make it seem as though he will be back sooner than later. Blaine Gabbert took most of the snaps during the Titans' team warmup drills prior to the game, suggesting he'll likely receive the starting nod over Mariota, Turron Davenport of ESPN.com reports. As the 1 p.m. EDT kickoff approaches, it's unclear whether or not Mariota (right elbow) will start Sunday's game against the Texans, nor is it known how extensively he'll be used if he does play, Erik Bacharach of the Tennessean reports. Analysis: Mariota is in uniform, but the team's only other active signal-caller, Blaine Gabbert, could end up seeing his share of snaps Sunday behind the Titans' depleted offensive line. Given the lack of clarity with regard the duo's Week 2 workload, neither quarterback is an appealing option in fantasy lineups. Mariota (right elbow) is not among the Titans' inactives for Sunday's game against the Texans, Jim Wyatt of the team's official site reports. Analysis: There's been talk that both Mariota and Blaine Gabbert could see action Sunday. Given that muddled context, in addition to reports that Mariota is having issues gripping the football, the QB looks like a very risky fantasy roll in Week 2 despite being in uniform. Mariota (elbow) didn't make many throws during pregame warmups Sunday, Adam Schefter of ESPN reports. Mariota (right elbow), who is listed as questionable for Sunday's game against the Texans, "still isn't able to grip the ball normally," a source told Adam Schefter of ESPN. Analysis: The Titans haven't decided who will start between Mariota and Blaine Gabbert and will likely wait until warmups to render a verdict, but this report would seemingly makes it unlikely Mariota will be out there for the team's first drive or be effective if he plays. Still, Mariota did practice in a limited fashion both Thursday and Friday to keep hope alive for an appearance in Week 2. Mariota (right elbow) is listed as questionable for Sunday's game against the Texans after practicing in a limited fashion both Thursday and Friday, ESPN's Turron Davenport reports. With Mariota (elbow) still being evaluated, coach Mike Vrabel suggested Friday that he expects both Blaine Gabbert and Mariota to play Sunday against the Texans, Jim Wyatt of the Titans' official site reports. Analysis: That's not the most fantasy-friendly nugget, and unless there's added clarity on that front, Mariota will be a risky Week 2 roll. Look for the QB to be officially listed as questionable once the Titans issue their final injury report of the week later Friday. Titans head coach remains optimistic that Mariota (elbow) will play Sunday against the Texans, despite the quarterback being limited in Thursday's practice, Jim Wyatt of the team's official site reports. Coach Mike Vrabel relayed that Mariota (right elbow) was limited at practice Thursday, Jim Wyatt of the Titans' official site reports. Analysis: Mariota was listed as a full practice participant Wednesday and with no reported setbacks, for now we'll operate under the assumption that his limitations Thursday were maintenance-related. Titans head coach Mike Vrabel said Mariota (elbow) practiced fully and without any setbacks Wednesday and is thus on track to start Sunday's game against the Texans, Travis Haney of The Athletic reports. "[Mariota] was able to get through and do everything," Vrabel said. "He looked OK. Barring any setbacks, Marcus is going to be good to go on Sunday." Analysis: Mariota was removed from the season-opening loss to Miami in the third quarter after he lost feeling in some of his fingers and threw a pair of interceptions. His injured throwing elbow must be healing quickly, as it sounds like he didn't have any limitations during Wednesday's session. Blaine Gabbert would get the Week 2 start if Mariota experiences any setbacks prior to the weekend. Coach Mike Vrabel said Monday that Mariota (elbow) is still being evaluated, Turron Davenport of ESPN.com reports. Coach Mike Vrabel said Mariota's elbow injury will require further evaluation, Erik Bacharach of the Nashville Tennessean reports. Mariota was removed from Sunday's game against the Dolphins with an elbow injury and is questionable to return, Paul Kuharsky of 104.5 The Zone Nashville reports. Analysis: Mariota had a rough afternoon prior to the injury, tossing a pair of interceptions on 16 pass attempts. Blaine Gabbert took over at quarterback with the Titans down 10-3 late in the third quarter. Mariota completed five of eight passes for 43 yards and one interception during Saturday's preseason game against the Steelers. He also rushed once for one yard. Mariota looks noticeably faster in practices than he did last season, Jim Wyatt of the Titans' official site reports. Mariota opened the preseason by completing two of three passes for 42 yards and a touchdown while adding a seven-yard scramble in his lone drive of work during Thursday's 31-17 loss to Green Bay. Mariota expects to play in Thursday's preseason opener against the Packers, Jim Wyatt of the Titans' official site reports. Analysis: Some teams hold out starters for the first week of the preseason, but the Titans unsurprisingly want Mariota to get some reps as he adjusts to a new coaching staff. It's unclear exactly who will be catching his passes Thursday, as Rishard Matthews (undisclosed) is still on the PUP list and Corey Davis (undisclosed) has also missed quite a bit of practice time. Mariota didn't use a knee brace during the team's OTA session Tuesday, but he has yet to make a decision whether or not he will wear it during the season, Terry McCormick of TitanInsider.com reports. Analysis: Mariota's availability isn't in question, but wearing a brace could hinder his mobility and output on the ground during the 2018 campaign. More information on that front should surface as the regular season nears, though the issue shouldn't have a large overall impact either way. The Titans are planning to exercise their fifth-year option on Mariota's rookie contract, Jason Wolf of The Tennessean reports. Mariota's outlook for the 2018 season received a major boost following the Titans' hiring of offensive coordinator Matt LaFleur, Jason Wolf of The Tennessean reports. A strained quad hampered Mariota's mobility for the bulk of the Titans' 35-14 playoff loss to the Patriots on Saturday, ESPN's Cameron Wolfe reports. Mariota completed 22 of 37 passes for 254 yards and two touchdowns while adding 37 yards on four rushes in Saturday's 35-14 loss to the Patriots in the divisional round. Mariota completed 19 of 31 passes for 205 yards, two touchdowns and an interception while adding a six-yard receiving score on a deflection and eight carries for 46 yards in Saturday's 22-21, wild-card round win at Kansas City. Mariota completed 12 of 21 passes for 134 yards with one touchdown and no interceptions in Sunday's 15-10 win over the Jaguars. He also rushed 10 times for 60 yards and lost a fumble. Mariota completed 22 of 39 passes for 275 yards and an interception while adding 24 yards on three scrambles in Sunday's 27-23 loss to the Rams. Mariota completed 23 of 33 passes for 241 yards and two touchdowns during Sunday's 25-23 loss to the 49ers. He also carried twice for an additional four yards. Mariota was a full participant in all of the Titans' practices this week, suggesting the minor right knee sprain he sustained last week isn't a concern heading into Sunday's game against the 49ers. Mariota (knee) was a full participant at Wednesday's practice, but his hamstring ailment from earlier this season is still having an impact, and his fibula fracture from last year may require a clean-up procedure at the end of the campaign, according to freelance NFL reporter Paul Kuharsky. 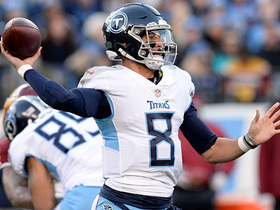 Titans head coach Mike Mularkey confirmed Monday that Mariota (knee) is expected to practice Wednesday and play in Sunday's game in San Francisco, Cameron Wolfe of ESPN.com reports. Mariota played through a knee injury in Sunday's 12-7 loss to the Cardinals, Cameron Wolfe of ESPN.com reports. Mariota completed 15 of 23 passes for 150 yards and a touchdown while rushing three times for 23 yards and another touchdown in Sunday's 24-13 win over Houston. Analysis: Mariota made some key plays with his legs, highlighted by a nine-yard rushing touchdown in the second quarter. His lone passing touchdown was a 24-yarder to Delanie Walker to break a 10-10 tie with three seconds left in the third quarter. Mariota's really missed top wide receiver Rishard Matthews (hamstring) over the past two weeks, throwing for a combined 334 yards, two touchdowns and two interceptions in that stretch. Mariota completed 17 of 25 passes for 184 yards with one touchdown and two interceptions while rushing for four yards on three attempts in Sunday's 20-16 win over the Colts. Mariota completed 22 of 33 passes for 306 yards with one touchdown and four interceptions in Thursday's 40-17 loss to the Steelers. He also rushed five times for five yards and a touchdown. Mariota (ankle/shoulder) doesn't carry an injury designation on the final injury report ahead of Thursday's game in Pittsburgh, Cameron Wolfe of ESPN.com reports. Mariota (ankle) practiced in full Tuesday, Jim Wyatt of the Titans' official site reports. Analysis: Listed as a limited participant Monday, Mariota cleared up any question about his ability to play on a short week after emerging from Sunday's win against the Bengals with a sore shoulder and mild ankle sprain. On Thursday, he may have difficulty taking aim at a Steelers pass defense ranked second in the NFL (181.8 yards per game) that has also allowed the third-fewest touchdowns (eight in nine games) through the air to opposing quarterbacks. Mariota (ankle/shoulder) is listed as a limited participant on Monday's injury report, Paul Kuharsky of 104.5 The Zone reports. Though Mariota is nursing a sore shoulder and mild ankle sprain, his status for Thursday night's game against the Steelers is in no danger, Cameron Wolfe of ESPN.com reports. Analysis: Moreover, Mariota will continue to see his normal allotment of practice reps in advance of the contest, as he works his way through what appears to be a pair of minor ailments. We'll circle back later on the QB's status, however, to see how his participation is classified on the Titans' first injury report of Week 11. Mariota injured his left shoulder during Sunday's 24-20 win over Cincinnati, but the ailment isn't believed to be serious, Jason Wolf of The Tennessean reports. Mariota completed 25 of 44 passes for 264 yards with a touchdown and an interception while adding 51 yards on six carries in Sunday's 24-20 win over the Bengals. Mariota completed 19 of 28 passes for 218 yards with two touchdowns and an interception while rushing three times for six yards in Sunday's 23-20 win over Baltimore. 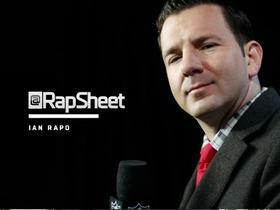 NFL Network Insider Ian Rapoport has the latest on the Tennessee Titans starting quarterback Blaine Gabbert over Marcus Mariota vs. the Indianapolis Colts. 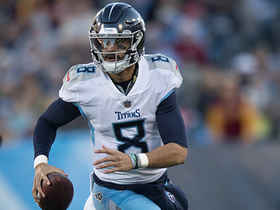 NFL Network's Mike Garafolo reports the latest on the status of Tennessee Titans quarterback Marcus Mariota and his availability for his team's Week 17 matchup with the Indianapolis Colts. NFL Network Insider Ian Rapoport discusses the likelihood that Tennessee Titans quarterback Marcus Mariota plays vs. the Indianapolis Colts in Week 17. 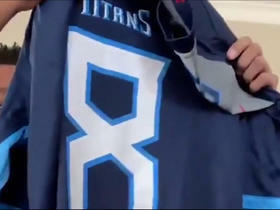 Watch NFL Network's Nate Burleson surprise his two boys with jerseys from Houston Texans quarterback Deshaun Watson and Tennessee Titans quarterback Marcus Mariota. NFL Network Insider Ian Rapoport reports the latest on the status of Tennessee Titans quarterback Marcus Mariota ahead of his Week 17 matchup with the Indianapolis Colts.